Union Home Minister Rajnath Singh at the meeting in Shillong. 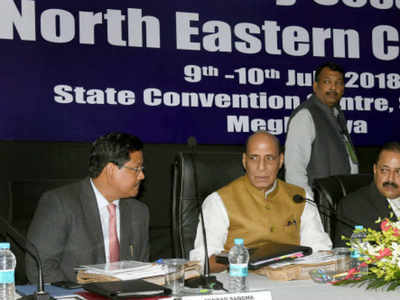 Union Home Minister Rajnath Singh on Tuesday said that the central and state governments in the Northeast should take advantage of the improving security scenario to develop the region hit by decades of insurgency. “Issues in the Northeast can be resolved through mutual dialogue,” he said on the second day of the 67th Plenary Session of the North Eastern Council (NEC), the nodal agency for the economic and social development of the region. “…we can’t be successful in our efforts of developing the region till there is total transparency to end leakage in the system,” he said, adding he needed the support of the Chief Ministers of the eight northeastern states in this direction. He added that a roadmap will be made to sort out the obstacles emerging in the growth of the region. Addressing the security-related issues in the Northeast, he said, “There has been a problem of insurgency for years — that has been hampering the growth of the region despite all its economic potential. “But there has been a decline (in insurgency) in the recent past, which is a matter of great luck for us. We should take advantage of this improving situation,” he said. Singh added that the law and order situation can’t be the sole responsibility of the central agencies. He said that road connectivity had been “speedily” increasing. “The way there is a need of highways, the similar way, there is a need of I ways,” he said, referring to the Information and Technology sector. “There is a need to create new ways… to make the IT sector more effective… if we improve facilities, the people won’t have to go to other parts of the country. They can work here itself.